When novel drugs are developed, PET method is very useful in determining suitable drug dosage (Wong et al., 2009). 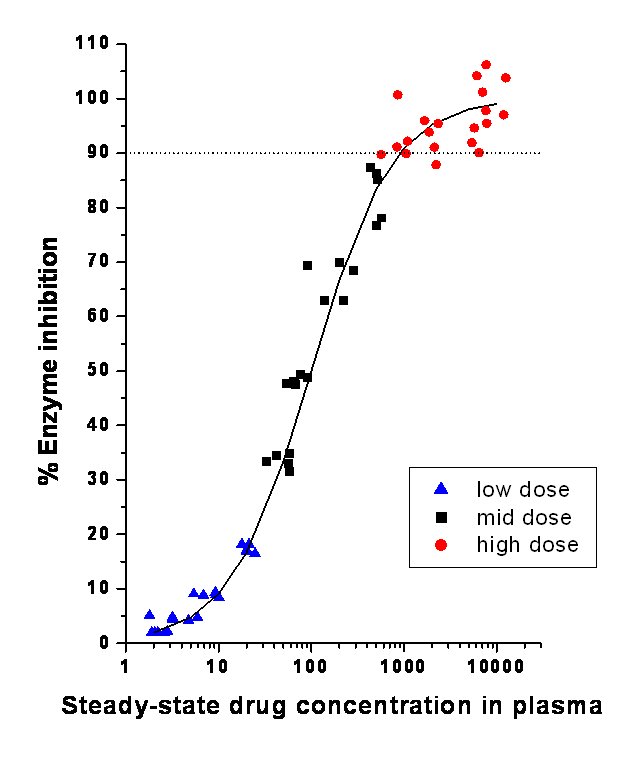 Drug-induced receptor occupancy, or enzyme inhibition, is measured with PET at different drug plasma concentrations. 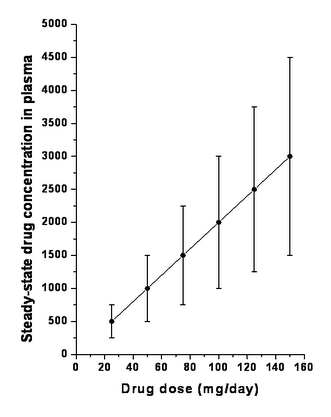 Occupancy or inhibition is plotted as a function of drug concentration in plasma, and a function may be fitted to the curve. This curve can be accomplished with relatively few subjects and PET studies. Estimate the drug steady-state concentration that leads to desired (usually >90%) enzyme inhibition or receptor occupancy. With pharmacokinetics studies (without PET), with considerably more study subjects, we can then determine the oral drug dosage that leads to required plasma concentration. Combining PET and pharmacodynamic studies we can determine the drug dosage that leads to required enzyme inhibition or receptor occupancy. Bretz F, Hsu J, Liu Y. Dose finding - a challenge in statistics. Biom J. 2008; 4: 480-504. Fischman AJ, Alpert NM, Rubin RH. Pharmacokinetic imaging - a noninvasive method for determining drug distribution and action. Clin Pharmacokinet. 2002; 41(8): 581-602. Matthews PM, Rabiner EA, Passchier J, Gunn RN. Positron emission tomography molecular imaging for drug development. Br J Clin Pharmacol. 2012; 73(2): 175-186. Wong DF, Tauscher J, Gründer G. The role of imaging in proof of concept for CNS drug discovery and development. Neuropsychopharmacology 2009; 34(1): 187-203.